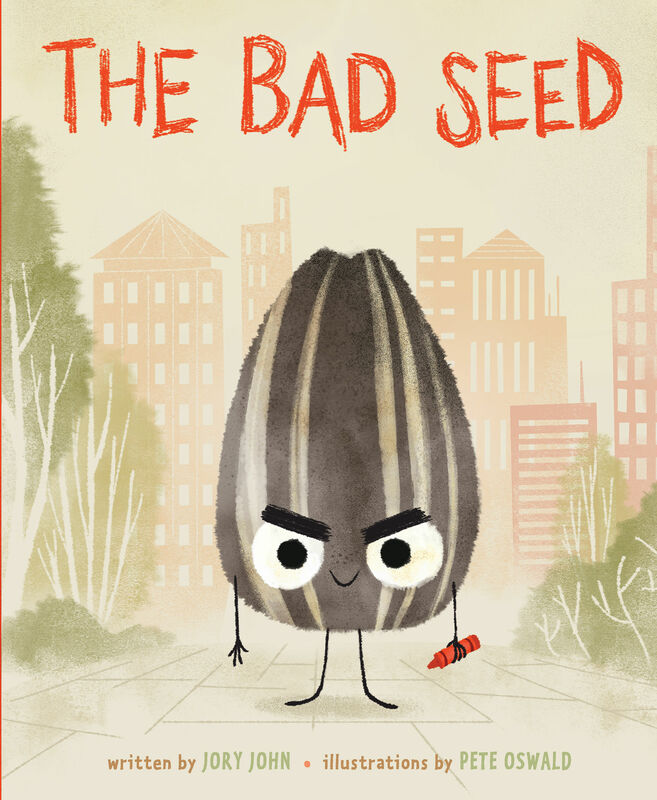 Production designer of animated films and children’s book illustrator Pete Oswald’s latest project involves an angry sunflower seed with humorously large eyebrows – which with help of author Jory John – has become a positively received, relatable-for-all-ages children's book due to Pete's excellent character design. While working as the production designer for the Angry Birds Movie 2 (a franchise he has served for the past four years) and fathering his two sons, Pete somehow found time to illustrate Mingo the Flamingo earlier this year, and has just released a new children’s book published by HarperCollins – The Bad Seed. It’s already had a glowing review in the New York Times and has been added to Amazon’s list of best children’s books of the year, alongside Oliver Jeffer's Here We Are and The Wolf, the Duck and the Mouse, illustrated by Jon Klassen. Pete’s previously worked on films such as Madagascar: Escape 2 Africa, Cloudy with a Chance of Meatballs 1 & 2, ParaNorman and Hotel Transylvania. As a production designer he’s responsible for the overall aesthetic of the film, including characters, lighting and set design. Working in both animation and illustration Pete bridges two worlds, both glued together with his love and talent for character design. Claiming that he doesn’t have a preference of one over the other, Pete does admit possessing the balance and experience of both makes him a better storyteller in both departments. We speak to Pete Oswald about core principles when it comes to designing characters specifically for children (both in illustration and animation), how to create a character that is relatable, and how his latest children’s book came about. Pete grew up with his mother teaching art classes from her basement in Utah. After sitting at the back of her lessons, Pete went on to study animation in Los Angeles and scored his first job at Cartoon Network. He’s currently responsible for the entire look and feel of the Angry Bird films as a production designer. He says it’s creatively satisfying, but it’s also about delivering a great product. 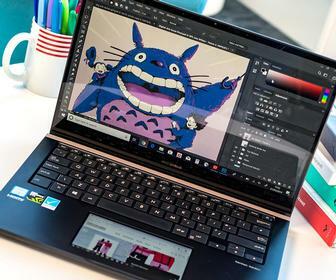 When designing characters Pete says it’s about how your design can benefit the narrative. 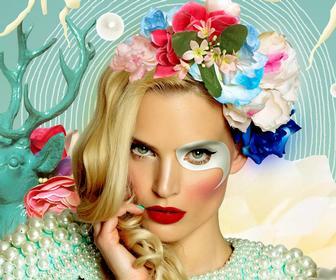 "I'm always drawn to designs that are incorporated into what the character is doing, how he's feeling, or she is feeling, or what that character does,” he says. “It's [about] always relating back to making your design decisions based on what's happening with the character in the story." This is how his new children’s book, The Bad Seed, began. 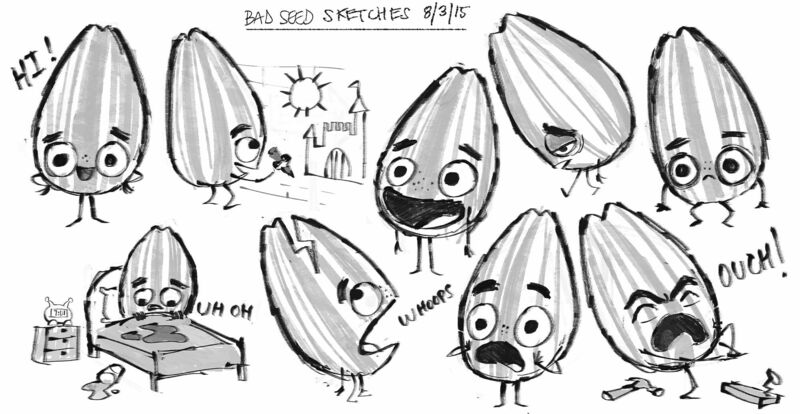 After initial sketches of a sunflower seed, a narrative with deep undertones blossomed. "It was just a fun sunflower seed, a play on words. He’s definitely evolved, but it was just a sunflower seed with angry eyebrows," he says. "I talked with my book agent, and he took it to HarperCollins, and HarperCollins said, 'We should pair you up with Jory John,' who I was a big, long-time fan of. He he wrote this wonderful, funny manuscript, and the pieces just all fell together." But Pete admits this isn’t always the case, and the difficult part is usually turning an idea into a whole concept. "As an artist, there's always a lot of ideas floating around in the air, 'Oh, that would make a cool idea for a book.' But it's actually sitting down and putting all those pieces together to make a complete book is the difficult part." 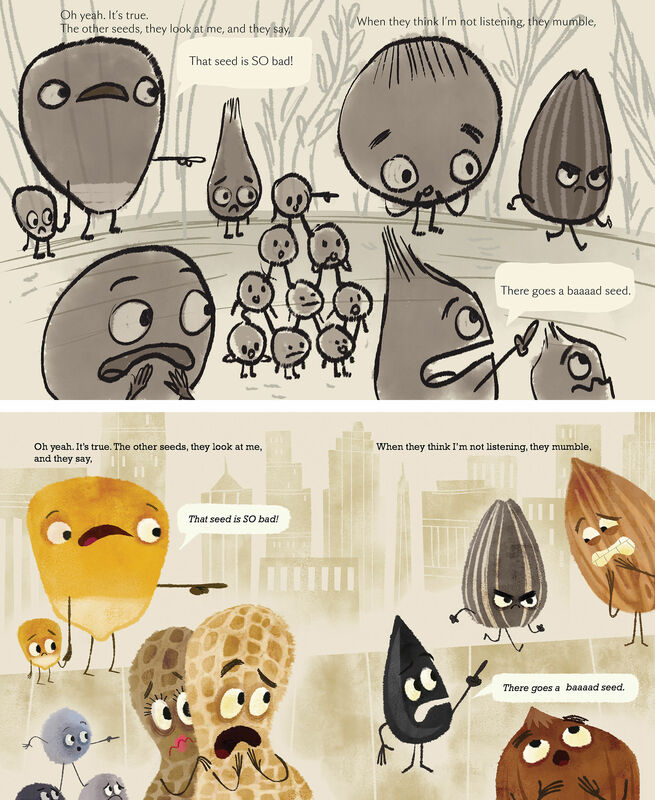 The Bad Seed is full of unlikely characters, including an array of nuts and seeds, such as peanuts and acorns. The Bad Seed himself is pointed and laughed at for being late, not putting things back where they belong, "lying about pointless stuff" or telling long jokes with no punchline – things both adults and children can relate to, and can think of at least one time they’re guilty of doing the same. 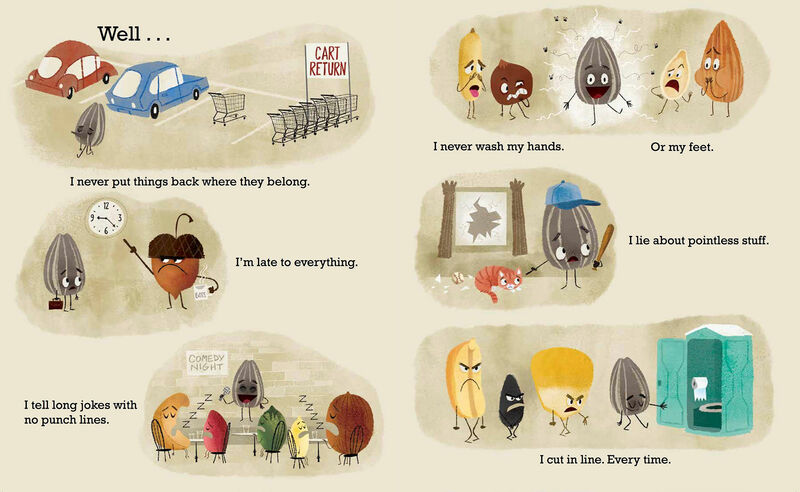 But by the end of the book the seed has a positive turn around, and decides he wants to be happy. The narrative explores the transformative power of will, accepting humanity and realising we all make mistakes. It’s about understanding where we all come from – the way we act on the surface might not necessarily best represent who we are. The message of inclusion and acceptance is timely in light of current divisive politics. "I think it's such a great story to tell that change is possible. That's what I love about this, that somebody can change, and somebody can have a change of heart. It makes it more humanistic," says Pete. The seed’s character treads carefully between being the villain and the reader feeling sympathy toward him. "It's [about] finding a character that is relatable, that is likeable, that is appealing. Even if you're designing a villain, I think you still want a certain appeal and acceptability to that character," says Pete. Pete says when designing a character, it’s about a mixture between the aesthetic of the character and the story. Trust your first emotional response to the character. Also seek feedback from other artists because it’s easy to get "caught in your own vacuum." "With The Bad Seed, I think that what is successful with him is the juxtaposition between something cute and something dangerous. You get that kind of dichotomy of the two, and I think that's a really fertile place to tell the story." Pete says the eyes are the most important feature of a character, and this is where he begins to draw the character. The eyes are where connection takes place, and that’s where you build emotion, specifically if the rest of your character is quite minimalistic – like the seed. "It's all about his big eyes, and his big eyebrows, and his tiny little mouth and cute appeal. What I love about the bad seed is that you boil down to its minimal qualities," he says. It’s also important to composite the facial features in just the right way. It took a long time for Pete to get the bad seed’s expression perfect for the very crucial cover illustration. “We didn't want him to be too angry, and we wanted them to be appealing. It took a long time to get those eyebrows just perfectly, that smile just right. "It took a couple of weeks back and forth with the publisher and the art director, and myself, just figuring out what that right, specific expression for the cover of the book would be." If you're also creating a narrative, find a story that resonates with you first as the artist, then boiling a concept down to the simplest terms, says Pete. "I was really lucky enough to collaborate with the writer Jory John on this. He brought just a whole other level of sophistication and comedy to this bad seed character." 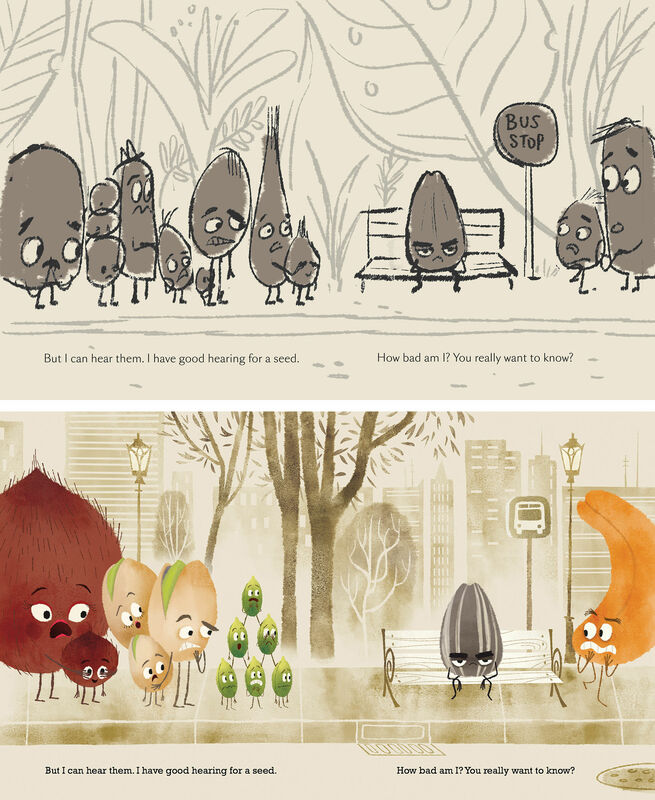 Pete and Jory wrote the script and storyboard for an animated trailer for the children’s book, and an artist at HarperCollins animated Pete’s illustrations. Check it out. And lastly, testing out your ideas on children. Pete has two of his own. "The great thing is they're pretty honest. They'll be like, 'I don't know about that, Dad.' So it's fun to test ideas out on them, and get their first hand opinion. They're going to have ideas that I have never even thought about. “I was trying to figure out how the story can mix in a dragon and a cheetah. Then my eldest son said, "Why don't we just make one animal and combine them into a half-dragon, half-cheetah?" I was like, 'That's brilliant. That's so cool.' I would have never thought about that." Off the back of The Bad Seed, Pete and Jory are working on other books together and Pete continues to work as production designer on the Angry Birds Movie 2, expected to be released in September 2019. Buy The Bad Seed for £12.99/ US$7.31 from Amazon. 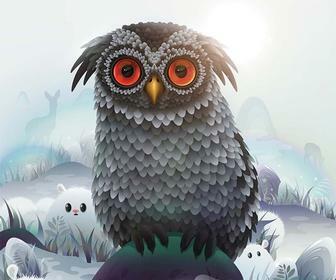 For more on character art, check out our tips form leading illustrators.